Banks and financial institutions are considered to be the most targeted organizations by money launderers and terrorist groups, in efforts to hide their identities and conceal the sources of their illegitimate funds. It is necessary to comprehend the dangers associated with money laundering and terrorist financing activities, through the use of banks and financial institutions as a means to pass through dirty money earned from committing various types of organized criminal activities. Answering inquiries from financial establishments and offering guidance related to the manner of the Office’s operations. The Iraqi Central Bank and the Money Laundering Reporting Office may also liaise with foreign authorities that supervise financial establishments or markets, as well as foreign criminal authorities, in order to exchange information and documents needed to carry out its duties in the fight against money laundering. The Central Bank issues necessary regulations and periodically distributes lists related to financial activities which might form suspicious transactions, including money laundering, criminal financing activities, transactions that employ funds accessible to a criminal organization, or transactions designed to avoid reporting or registration conditions. The Central Bank has the right to carry out site audits at financial institutions. The Central Bank also provides lists of persons and organisations, often based on lists produced by the United Nations Security Council, which financial institutions should monitor against transactions. Upon the discovery of a transaction by a listed person or organisation, a report should be filed with the Central Bank. 1. Verification of the client’s identity. When an account is opened, or when a transaction or series of eventual transactions whose value exceeds five million Iraqi Dinars per customer (whether a natural or juridical person) are carried out, the financial institution must obtain the legal name of this customer and his permanent or correct complete address, telephone or fax number and (in the case of natural persons) the date and place of his birth. Juridical persons must provide the incorporation statement, the nationality and the place of incorporation. If the total value of the transaction or of the series of transactions is less than one million Iraqi Dinars, the financial institution needs only the name and address of the customer. The financial institution must verify whether the name of the customer appears on the list provided by the Iraqi Central Bank and report any suspicious transactions to the Iraqi authorities. The financial Institution must request from the customer a written statement about the owner of the monies in cases where it becomes evident that the customer is not the owner, or the ownership of the monies are subject to suspicion, or the transaction is for an amount higher than one million Iraqi Dinars. The financial institution ought to take additional steps to verify the identity if it has a reason to doubt the identity of the customer or the beneficial owner of the funds. In case the financial institution cannot form a reasonable image regarding the identity of the customer or the beneficial owner, it must report any suspicious transactions to the Money Laundering Reporting Office. Also, when the financial institution transfers an insurance premium payment or distributes or refers a benefit earning to a person, it must verify the identity of the beneficial owner, if it becomes evident that the beneficial owner is not the designated one according to the contract. The financial Institution shall immediately verify the source of the funds, the nature and the intended purpose of the transaction. Also, it must verify any suspicion whether the funds consist of revenues resulting from a criminal activity or intended to finance a crime. The financial institution must immediately report to the Money Laundering Reporting Office if it is believed that the proposed transaction or series of transactions are suspicious and seek the advice and directives of the Reporting Office. It must follow the guidance and instructions of the Money Laundering Reporting Office and the financial institution, its director, any officer, employee or agent shall not be liable according to any Iraqi law or regulation. When the financial institution requests an investigation, the respective assets must be frozen until it receives directives from the Money Laundering Reporting Office. The financial institution must report to the Money Laundering Reporting Office in the case of having reason to suspect a transaction – whether it was done by the customer or by another party – where the transaction or transactions total more than two million Iraqi Dinars. This reporting must be done as soon as possible and before the elapse of fourteen days after the date of the event leading to the suspicion. The financial institution must keep the records in separate files, which contain all the details related to the reporting. These files must be conveyed to the Iraqi Central Bank and to the Money Laundering Reporting Office as well as to the judicial prosecuting authorities. These records must be kept for a minimum period of five years after the date of reporting to the Money Laundering Reporting Office. Every financial institution must organize a report for the Money Laundering Reporting Office for every deposit, withdrawal, currency exchange or other transfer through or to the institution that deals with fund transactions, or by using any other type of monetary instrument, which exceeds fifteen million Iraqi Dinars. The amount and type of the monetary instrument. Money laundering activities are a threat to the national and global economy, both in real and reputational terms. 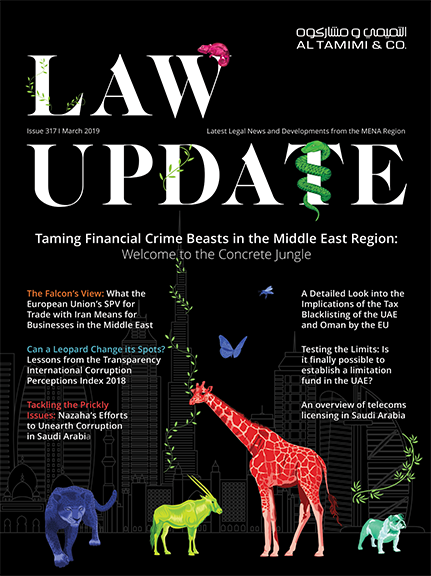 The Iraqi government is tackling this threat with the AML Law and we continue to watch with interest as financial institutions act in compliance with its provisions in a combined effort to reduce the effects of organised crime on the Iraqi economy in particular and the global economy as a consequence.